The story of Brooks Park transcends prose. It's a drama, a poem, an ode to a neighborhood's determination and persistence. Brooks Park is an island of trees and native plants on the far western edge of Merced Heights. From here one can see the towers of Parkmerced, the San Francisco State campus, the glimmers of Lake Merced and the Pacific Ocean. From here, Mount Davidson, Fort Miley, and the Marin Headlands look to be in the reach of a tall man. From here, Ingleside Terraces, Balboa Park and Westwood Highlands undulate like lumpy carpets around the old El Rey Theater. The whole west of San Francisco lies below one like a soft bed after a long hike. Certainly the Ohlone Indians who camped along Lake Merced's shores took in the ocean breezes from this same hill. Did their children roll down the tall grasses of the western slope, like my daughter is tempted to do? One hundred years ago, the Merced Heights ridgeline appeared almost bald. The grasses and low plants amidst the rocky outcrops seasonally shifted, like on most California hills, from green to brown. In the Spring poppies, pansies, and other flowers splattered the canvas with orange, white and purple. Small farms and homesteads began filling in the flat landscape below the ridge. 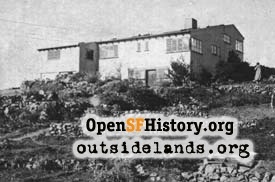 In the 1910s and 1920s streets and sidewalks followed the train and streetcar lines west and south, and the larger developments began encroaching on what locals called "Pansy Hill", "Poppy Hill" or "Kite Hill". In 1936, Jesse and Helen Brooks bought the peak of the far western hilltop "because it was out in the country." 1 Helen's architect brother helped design a home which was very crafty in style, featured prominent brickwork and emphasized the views all around. While Mr. Brooks ran a stationery store on Irving street, Mrs. Brooks began working on the land around the house, starting an artistic relationship between woman and nature that lasted 30 years. "She loved to garden from noon until night," her daughter Winifred told me. "[Gardening] was her life." Helen Brooks recognized the beauty and usefulness of the native plants and to these she added flowers, a vegetable garden, trees, and a bee hive. She recycled and composted years before most people knew those words existed. She taught local kids gardening and offered her "spare" plants and flowers to any community event that asked for them. In the house she had a loom and made her children's clothing. There were chickens, a rooster, ducks, dogs, and even a fawn that would occasionally jump the fence and roam the neighborhood! In many ways the Brooks lived a country life in a major metropolis that kept closing in. In the mid-1960s, Helen and Jesse decided to retire to a more rural setting on the Peninsula, and explored selling the house and land, which amounted to some 14 city lots. The City of San Francisco became interested in having the magnificent plot as a public park, and the Brooks were initially very excited about the idea. Neighborhood groups became thrilled that the home could be a community center and Helen's gardens a recreational spot and learning lab for children at Jose Ortega Elementary School next door. Helen was particularly hopeful that her gardens would live on, rather than being paved over for development. After two more fires were set, the city bulldozed the remains of the former Brooks home. All the same, it was an ominous sign: as most of the community fought to make Brooks Park a welcoming garden spot for families and neighbors, some other part wanted it to remain a ground for crime and violence. The 1980s brought crack cocaine to the OMI, and Brooks Park became a haven for drug dealing. At least two bodies were dumped up on the hill until the old driveway was blocked off. In the early 1990s came the new "sport" of illegal pit bull fighting. Neighbors saw the shadowy figures leading the animals into the park at night, and in the morning often found the carcasses of losing dogs. Seriously wounded pit bulls, bred to be aggressive and dangerous, wandered bleeding around the streets. People avoided the park, warned each other about it. They called the police, animal control, the Rec and Park department. Nothing seemed to change at first, but there were neighbors who were determined to make a difference. In 1986, Peter Vaernet moved to Shields Street, just a stone's throw from Brooks Park. He saw all the problems going on, had bullets shot into his garage, watched drug deals happening out his living room window. But he also saw all the strengths of the area: the beautiful views, the open space, the good neighbors all around him. Peter wasn't the type to lay low and hope things would get better. "I'm crazy, I guess. I'm a Viking. You know, Vikings love battles. The only way Vikings go to heaven, according to the old Valhalla theory, is you have to die in battle to really go to heaven. Vikings are, generally speaking, mad. I mean, I don't think I ever felt scared, because I knew what was right. And Minnie, I don't think that Minnie was scared either." "Minnie" was Minnie Ward, who with her husband Lovie was already fighting the same problems down the hill. The Wards helped form the community group "Neighbors in Action" (NIA), and Peter joined up immediately. The Wards were committed not to just eradicating the drug dealing in their neighborhood, but to providing the youth of OMI with alternative activities. They fought to have Sheridan School rebuilt to provide a safe and modern learning environment, and to have appropriate youth programs at Ocean View Recreation Center across the street. Peter took a similar tack at Brooks Park. In addition to chasing off the drug deals and pit bull fights, other activities had to be programmed for Brooks Park to bring in the families, the older people, to "take back" the hilltop. Peter will credit all the different people who stepped up, and it's true that Brooks Park today is a triumph to a community's collective will to change a bad situation. But Peter is the catalyst Lonnie Lawson talked about. He's the man who walks in his "backyard" everyday picking up litter, pulling weeds, handing out flyers for the tai chi classes, chatting with any and every person he passes. "Come to Brooks Park. See how wonderful things are." In June 2003 I traveled down the Peninsula with Shields Street resident Karen McCabe to interview Winifred Desch, the daughter of Jesse and Helen Brooks. We told Winifred how her childhood home has recently become an amazing place. She hadn't returned in decades, and admitted to being scared to look. She didn't want her eyes to confirm all the tragedies and bad news she had heard over the years. Peter tells me, "Tell her to come in the spring, when the wildflowers are in bloom." 1. Margot Patterson Doss, "The View from Kite Hill," San Francisco Chronicle, November 22, 1970, Sunday Punch section, pg. 7. 2. Winifred Desch interview, June 3, 2003, by Western Neighborhoods Project. 3. J.H. Brooks, "Procedure Followed in San Francisco's Acquisition of the Brooks Home...", Winifred Desch collection, private four page paper, n.d.
4. Lisa Hobbs, "Compromise In 'Kite Hill' Dispute Near", San Francisco Examiner, January 4, 1968, pg. 3. 5. 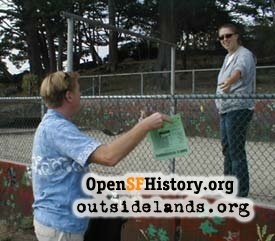 Maude Furlough interview, May 7, 2003, by Western Neighborhoods Project. 6. OMI News, May 1978, Vol. 10, No. 1. San Francisco History Center, San Francisco Public Library. Vertical file: "San Francisco Parks - Brooks Park". 7. Conversation with Lonnie Lawson, December 2, 2003. 9. Peter Vaernet interview, October 5, 2003, by Western Neighborhoods Project.